Photo credit: League of Women Voters of Asheville-Buncombe County. One year ahead of the next major election in North Carolina, the city of Asheville is hosting a unique race to highlight how state Republicans have redrawn district lines in their favor. The Gerrymander 5K “walk/run” is no race for the faint of heart — or the weak-ankled. That’s because its route traces the outlandish district line that separates North Carolina’s 10th and 11th congressional districts. The fine-tuning of these districts has resulted in Republican majorities in a city that typically votes overwhelmingly for Democrats. Participants will be forced to take the same sharp turns that closely divide neighborhoods and, in some cases, individual households. Such meandering district lines have become the norm throughout North Carolina, and their bizarre shapes would be almost comical if the very foundations of democracy were not at stake. That is precisely what the race is supposed to illustrate in an innovative way that will hopefully catch on elsewhere. Asheville was once represented in the US House of Representatives by a Democratic Congressperson elected by voters in the 11th district. But after Republicans gained a majority in the state legislature in 2010, the congressional-district lines were redrawn in a way that dramatically altered subsequent election results. The League of Women Voters, which is staging the Gerrymander 5K race, has actively protested the unfair districts, filing five lawsuits since 2011. The US Supreme Court recently affirmed that North Carolina’s districts, as currently drawn, are extremely racially gerrymandered. The Republican-led General Assembly has been tasked with drawing new, fairer districts, apparently on the assumption that this time the same lawmakers will obey the letter and spirit of the law. 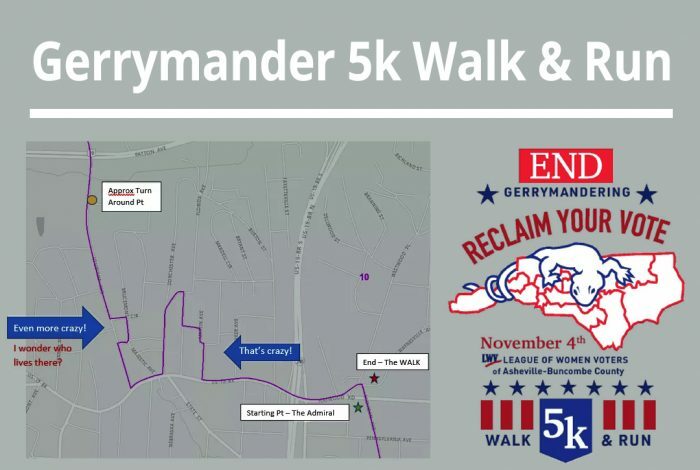 While the court’s action is a step in the right direction, the Gerrymander 5K is a unique opportunity to take 6,000 steps towards a better way: advocating for a non-partisan redistricting committee. Following a course that is sure to be full of twists and turns, participants will get an on-the-ground look at the “surgical precision” used by the GOP to hand-pick their voters. Those interested in attending can find out more here.